Cockroaches (or simply “roaches”) are insects of the order Blattaria. This name derives from the Latin word for “cockroach”, blatta. There are about 4,000 species of cockroach, of which 30 species are associated with human habitations and about four species are well known as pests. Among the best-known pest species are the American cockroach, Periplaneta americana, which is about 30 millimeters (1.2 in) long, the German cockroach, Blattella germanica, about 15 millimeters (1/2 in) long, the Asian cockroach, Blattella asahinai, also about 15 millimeters (1/2 in) in length, and the Oriental cockroach, Blatta orientalis, about 25 millimeters (1 in). Tropical cockroaches are often much bigger, and extinct cockroach relatives such as the Carboniferous Archimylacris and the Permian Apthoroblattina were several times as large as these. Cockroaches are one of the most commonly noted household pest insects. They feed on human and pet food, and can leave an offensive odor. They can also passively transport microbes on their body surfaces including those that are potentially dangerous to humans, particularly in environments such as hospitals. 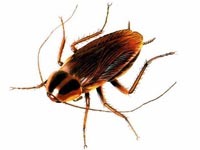 Roaches are a common problem with pest control throughout the United States. Cockroaches infestations have been shown to be linked with allergic reactions in humans. One of the proteins that triggers allergic reactions has been identified as tropomyosin. These allergens have also been found to be linked with asthma.